The below information on the Smith Famiy is currently as it relates to the Edward D. Pickett Family of New Hope, Pa. Family members names shown in "Marroon" are the direct ancestors of my children "Chris", "Ryan", "Kayla" & "Kara". Anyone that has information or questions on this family line please "email me". Thanks, and I hope you enjoy this short history of the Smith Family. Dilts, Steward, Updyke, Pickett & Johnson. 5. Charles Stewart Smith - b. Aug 4, 1843, d. ?? 7. James Wilson Smith - b.cir. 1853, d. ?? 8. Sarah Elizabeth Smith - b.cir. 1854, d. ?? 9. Emma Caroline Smith - b.cir. 1855, d. ?? Family Notes: The birth order of the children has not been verified. In the 1860 census the following children were listed: James (4) age 7, Sarah (5) age 6, & Caroline (6) age 5. Jesse (3) and Asa (4), who were both over the age of 18 at the time, more than likely had moved out of the home before the census. Jesse (3) married "Mary C. Williamson" and they had children. "Joseph Smith (2)" - "Eleanor Stuard Smith"
32. Albert K. Smith - b. 1879, d. ?? 33. William C. Smith - b. 1874, d. ?? "Jesse Wood Smith (3)" - "Mary C. Williamson Smith" - "Arabelle Smith (30)" - "Levi Smith (31)"
"Albert K. Smith (32)" - "William C. Smith (33)"
Asa (3) was born the 1st child & 1st son of Joseph and Eleanor Stuard Smith on May 4, 1842. His birth place is unknown at this time. 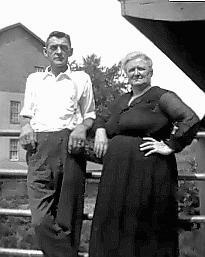 He married "Annie L. Updyke" in Hunterdon Cty, NJ. She was born in 1849 & her parent's names are unknown. They also resided in Hunterdon County at one time. Asa (3) died on May 10, 1909 at the age of 67. He was interred at the Rosemont Cem., Rosemont, NJ. His wife Annie died in 1919 & was interred next to her husband. Together they had 9 children. 34. Margaret Smith - b. 1867, d. ?? 39. Joseph Reading Smith - b. 1874, d. ?? 40. Lizzie A. Smith - b. 1876, d. ?? 41. John K. Smith - b. 1882, d. ?? 42. Allen C. Smith - b. 1888, d. ?? Family Notes: Allen (42) married "Ella D. _____" and they had two children together whose names are unknown. "Asa Smith (3)" - "Annie L. (Updyke) Smith"
Charles, (5) was born the son of Joseph and Eleanor Stuard Smith in 1843. He was married to "Emeline Reed" on February 22, 1869. She was born the daughter of William and Mary Bogart Reed in 1851. The exact date of Charles' (5) passing is currently unknown. However he was interred in the Rosemont Cemetery, Rosemont, NJ. Emeline passed away in 1920 and was also interred in the Rosemont Cemetery, Rosemont, NJ. They had eight children together. 43. Mary Louella Smith - b. Jan 5, 1870, d. ?? 44. Sarah Smith - b. ca. 1873, d. ?? 45. Florence H. Smith - b. May 1881, d. ?? 47. Jacob Reed Smith - b. Jul 14, 1886, d. ?? 48. Jesse W. Smith - b. Apr 26, 1890, d. ?? 49. Unknown Smith - b. ? ?, d. ?? 50. Unknown Smith - b. ? ?, d. ?? Family Notes: All the children were born in Hunterdon County, NJ. Florence (45) married "Ira Haines" in January, 1898 and they had three children: Joseph (b:11/7/1899 d: 12/1971 in Flemington, N.J.), a daughter Prudence b: 5/28/1901 and a son Jonathon b: 11/23/1904 d: 6/1966. Victoria (46) married "Charles M. Sipler" son of Charles Sipler and Mary Haines Sipler on August 21, 1897 and they had the following children: Lillian C. b: 2/24/1898 d: 5/11/1953, Emeline b: 1901, Sadie b: 1908, George H. b: 10/14/1912 d: 10/16/1992, Walter H. b: 10/14/1912 d: 3/1987, Isaiah V. b: 9/17/1914 d: 5/11/2004. "Charles Stewart Smith (5)" - "Emeline Reed Smith"
Charles, (36) was born the 3rd child & 2nd son of Asa (4) and Annie L. (Updyke) Smith in 1870 in Hunterdon County, NJ. He was married to "Jennie A. _____" whose last name, dates and parents are currently unknown in 1898. Charles (36) passed away in 1909 and was interred in Rosemont Cemetery, Rosemont, NJ. Jennie passed away in 1915 and was interred next to her husband. They had one known child. 51. Joseph Smith - b. Jan, 1899, d. ?? "Charles W. Smith (9)" - "Jennie A. Smith"
" Jacob D. & Eleanor M. (Smith) Pickett "
Eleanor (10) was born the only child of Asa and Annie L. (Updyke) Smith on June 21, 1871 in Hunterdon County, NJ. She married "Jacob Dunlap Pickett" ( See the "Pickett Family History" ) on December 23, 1893 in Lambertville. Jacob was born the son of John S. and Louisa J. (Everitt) Pickett on March 10, 1870 in New Hope, Pa. After their marriage they resided in New Hope. Eleanor (10) preceded her husband in death on April 11, 1927 at the age of 55 & Jacob died on May 21, 1948 at the age of 78. They are both interred in Riverview Cem., Lambertville. Together they had 4 children. 52. Emma Pickett - b. Nov 27, 1894, d. ?? Family Notes: Margaret T. (11) married "Warner T. Johnson" & is interred in Riverview Cem., Lambertville, NJ. Following are the numbers of the above four children in the Pickett family history: Emma (50), Asa (51), John (52), and Margaret (53). Jacob Dunlap Pickett, the father of the children, is number (17) in the Pickett family history. "Jacob Dunlap Pickett" - "Eleanor Minerva (Smith) Pickett (37)" - "Margaret T. (Pickett) Johnson (55)"
"Elizabeth (Smith) Dilts (38)" - "Herbert Dilts"
73. Prudence Haines - b. May 28, 1901, d. ?? 76. Emeline Sipler - b. 1901, d. ?? 77. Sadie Sipler - b. 1908, d. ? ?